The pope, dressed in a simple white alb and purple stole, spent about three minutes kneeling before the priest’s open confessional and received absolution. The priest also clasped the pope’s hands and kissed his simple silver ring. A seven-member team of medical experts convoked by the Vatican reported there is no natural explanation for the survival of a child delivered stillborn and whose heart did not start beating until 61 minutes after his birth. The medical experts’ report was announced in the Diocese of Peoria, Illinois, by the Archbishop Fulton Sheen Foundation, which is led by Bishop Daniel Jenky of Peoria. James’s mother, Bonnie Engstrom, described what happened when she addressed a 2012 gathering of the Midwest region of the Catholic Press Association in Peoria. During delivery, what caused James to be stillborn was that his umbilical cord had knotted itself, cutting off his blood flow and oxygen supply. The more he progressed through the birth canal, the tighter the knot became. “He was born stillborn,” Mrs Engstrom said, remembering how “his arms flopped by his side” when she reached for him to hold him. If the Engstrom case is authenticated as a miracle, Archbishop Sheen would be beatified, elevating his from “venerable” to “blessed”. A beatification ceremony could conceivably take place in Peoria, according to the foundation, which promotes his sainthood cause. In general, a second miracle would need to be authenticated for canonisation. VATICAN CITY—Francis mania is lifting up the religious media. As Pope Francis approaches the first anniversary of his election this week , his popularity is generating a boom for a media niche that rarely gathers much notice. “We are just working night and day to satisfy demand,” said Monsignor Dario Vigano, head of the Vatican’s broadcaster, Vatican Television Center, or CTV, which shadows the pope and supplies papal newscasts and images for both Catholic and lay broadcasters. Revenue at CTV leaped 40% in 2013, as broadcasters as far afield as Tanzania now want the recordings of the pope’s weekly audiences. The windfall has allowed CVT to splash out on more modern cameras and a new €1.8 million ($2.45 million) control room. Last week—on Ash Wednesday, the start of Lent — Mondadori MN.MI -0.68%Arnoldo Mondadori Editore S.p.A.Italy: Milan €1.47 -0.01-0.68% March 11, 2014 5:30 pm Volume : 203,757 P/E Ratio N/AMarket Cap€363.53 Million Dividend Yield N/ARev. per Employee €356,18103/11/14 Pope Francis’s Popularity a Bl…More quote details and news »MN.MI inYour ValueYour Change Short position SpA, the publishing house controlled by the family of media magnate-turned-politician Silvio Berlusconi, launched a new weekly dedicated to the pope. The magazine, Il Mio Papa, which will initially cost 50 euro cents a copy, will include a pullout centerfold with Francis quotes and will print three million copies for its first month of publication. Interest in the papacy exploded after Pope Benedict XVI’s surprise resignation last year, and it carried through the conclave that elected Pope Francis. But Pope Francis’s heartwarmingly human—and telegenic—gestures, such as washing prisoners’ feet on Good Friday and taking selfies with fans in St. Peter’s Square, have kept interest high. “We really have seen a ‘Francis effect,’” said Dennis Coday, editor of the National Catholic Reporter in Kansas City, Mo., whose monthly online page views have soared 44% since Pope Francis’s election. A rise in subscriptions and newsstand sales allowed the Tablet, a British Catholic magazine, to spend more than €7,000 to send its Rome-based correspondent on the papal plane to cover World Youth Day in Rio de Janeiro last July. It has also hired a stringer to cover Latin America, the home turf of the Argentine pontiff. “We wouldn’t have normally done the Brazil trip as it is colossally expensive,” said editor Catherine Pepinster. 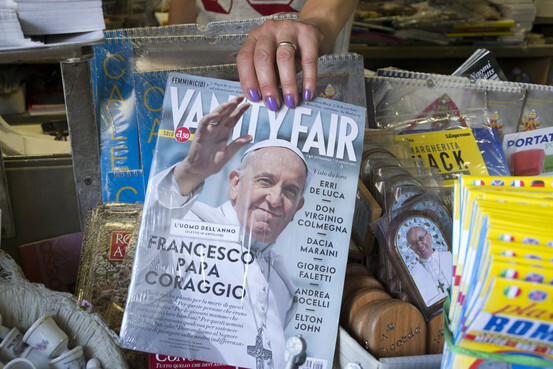 Pope Francis’s huge cross-over appeal also has drawn the mainstream media. He was put on the cover of Time magazine as 2013 Person of the Year, and he was the first pontiff to make the cover of Rolling Stone magazine. A Rolling Stone spokeswoman said that the pope issue, which was in January, sold above average. The warm, grandfatherly style of the 77-year-old Pope Francis not only contrasts with the more retiring and austere profile of Pope Benedict but also plays well in an age when high-profile figures speak directly to their audiences. Pope Francis has picked up the trend started by Pope John Paul II, the charismatic, globe-trotting pontiff who was an actor in his youth and delighted reporters with punchy one-liners. As a result, Vatican-owned media that enjoy special access to the pontiff have an edge. At Avvenire, the paper owned by the Italian bishops’ conference, circulation rose 5% last year, a rare bright spot on a dire Italian media landscape. And Catholic magazine Famiglia Cristiana launched a new weekly called “Credere, la gioia della fede” (Belief, the joy of faith) distributed to church-goers; it now sells nearly 60,000 copies, pushed up in part by increased attendance at Mass in Italy, according to general manager Maurizio D’Adda. La Civilta’ Cattolica, an obscure Jesuit journal, had to order extra printings of an edition last year featuring an interview with the pope. The publication usually breaks even in its annual accounts but it expects to post a profit for 2013, said Rev. Antonio Spadaro, managing editor of the Jesuit publication. He is considering opening more space to advertisers after a surge in demand, and launched the English edition of a book based on the papal interview last week. Pope Francis’s appeal is also seen in social media. Catholic News Service, a division of the U.S. Conference of Catholic Bishops, says its number of Facebook followers is up tenfold in the last year. A book of Pope Francis’s November manifesto, in which he criticized economic inequality, and two volumes of compilations of his “Simple Wisdom,” which are excerpts from his weekly audience talks, are selling briskly, said Catholic News Service. The books are published by the USCCB. Positive comments about the pope on Twitter have outnumbered negative ones by five to one so far in his papacy, according to Pew Research Center figures released last week. By contrast, 70% of tweets about Pope Benedict were negative during the year before he stepped down. Meanwhile, the Pope’s Twitter account, including a Latin version, has 12.2 million followers. Christianity in England is becoming an anachronism. Christianity in England is becoming an anachronism. Nearly half of Britons have no idea where to find story of Creation or Jesus! Christianity in England nearing extinction, being replaced by Islam, atheism. Goodbye Christianity, it was nice having you around, but it looks like the atheists have won. According to a report in the Daily Mail, a dwindling fraction of British children have any specific knowledge of the Bible and the Archbishop of Canterbury warns that the Church of England is now just a generation away from extinction. The church in England is becoming more of a relic than a vibrant institution. This is what happens when you weaken a church and replace tradition with pop theology. LONDON, ENGLAND (Catholic Online) – Christianity is on the retreat in England, being wiped out by a rising tide of secularism and atheism in that country. A new generation of children is growing up without the Bible or even the ability to cite the Bible as the source for stories they may have heard of, such as the story of creation, Adam and Eve, and Noah’s ark. The surge of Bible illiteracy is reflected in the Daily Mail’s statistics, which shows that 54 percent of children in England have never had Bible stories read to them by adults, and one-in-three people, including adults, could not identify where the birth story of Jesus could be found. All this is despite the fact that most Britons agree that the Bible and Christianity teaches good values and is useful for teaching good morals and values. Even atheists agree that people should be familiar with scriptures, although for less-than-honest reasons, and generally speaking, an understanding of the Bible is essential to appreciating English and European literature as well as history and culture. The study even claims that a stunning 46 percent of British parents who were surveyed misidentified a Harry Potter plot sequence as coming from the Bible. Support Biblical literacy now! As the Bible is removed from schools, is reshelved under “fiction” in libraries, and removed from hotel rooms, reverence for a book that has given us morals, values, laws, culture, and more, not to mention the obvious gift of a road-map to salvation (no less! ), Bible literacy is plummeting. Children can recite passages from Harry Potter, the Hunger Games, and other popular books, but they have no knowledge of the scriptures. It’s easy to see why when the parents also lack basic knowledge. It is a shame for many reasons, even if only taken from a literary standpoint. The Bible is filled with wondrous stories, thought-provoking parables, as well as psalms and proverbs that are famous around the world and throughout history. A person who lives by the commandments of the Bible lives well, no matter where. To withhold such knowledge from children is to unleash them upon the world wholly unprepared for the reality of life and the life to come after this. It borders on extreme neglect from many perspectives and schools should be turned to address this most glaring gap in education. More importantly, parents have a sacred and solemn obligation to learn the scriptures for themselves and to share this with their children. Let the warning of England be a warning to the rest of the Christian world. As Christianity in England dies, Islam and atheism continue to flourish. Marian Conclusion to “Evangelii Gaudium”. “Woman, clothed with the sun, with the moon beneath her feet, and around her head a crown of twelve stars” (Rev. 12:1). The Good News of ‘Evangelii Gaudium’. Dreams can be powerful things, especially when articulated by leaders with the realistic capacity to translate them into action. That was the case 50 years ago with Martin Luther King Jr.’s famous “I Have a Dream” speech, and it also seems to be the ambition of Pope Francis’ bold new apostolic exhortation, “The Joy of the Gospel.” In effect, the 224-page document, titled in Latin Evangelii Gaudium and released by the Vatican Tuesday, is a vision statement about the kind of community Francis wants Catholicism to be: more missionary, more merciful, and with the courage to change. Francis opens with a dream. “I dream of a ‘missionary option,’ ” Francis writes, “that is, a missionary impulse capable of transforming everything, so that the church’s customs, ways of doing things, times and schedules, language and structures can be suitably channeled for the evangelization of today’s world, rather than for her self-preservation.” In particular, Francis calls for a church marked by a special passion for the poor and for peace. NCR’s work is possible thanks to the generosity of people like you. …. Though Francis released an encyclical letter titled Lumen Fidei in June, that text was based largely on a draft prepared by Benedict XVI. “The Joy of the Gospel,” designed as a reflection on the October 2012 Synod of Bishops on new evangelization, thus represents the new pope’s real debut as an author. Early reaction suggests it’s a tour de force. 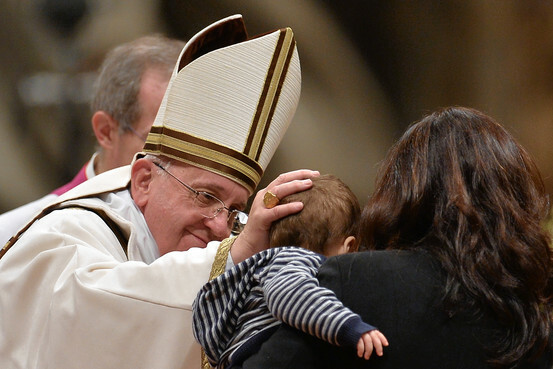 On two specific matters, however, Francis rules out change: the ordination of women to the priesthood, though he calls for “a more incisive female presence” in decision-making roles, and abortion. The pope’s toughest language comes in a section of the document arguing that solidarity with the poor and the promotion of peace are constituent elements of what it means to be a missionary church. Specifically, Francis calls on the church to oppose spreading income inequality and unemployment, as well as to advocate for stronger environmental protection and against armed conflict. In the end, “The Joy of the Gospel” amounts to a forceful call for a more missionary Catholicism in the broadest sense. The alternative, Francis warns, is not pleasant. 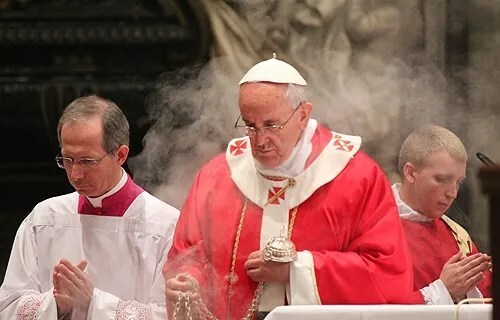 Editor’s note: Excerpts of Evangelii Gaudium will be posted to The Francis Chronicles over the next few days, and watch the NCR Today and Distinctly Catholic blogs for commentary on the apostolic exhortation.